Abbott Thayer described Mount Monadnock, the subject of this subdued, violet-blue landscape, as "this dear mountain." It provided continual artistic inspiration and personal solace for the artist throughout his life. In this depiction, he casts the majority of the scene in shadow, save for the stark white mountain peak, illuminated by the rising sun in the dawn sky. Thayer represents the mountaintop in thick, expressive strokes of paint, further differentiating the peak from the more smoothly rendered landscape in the foreground. Born in Boston and raised in rural New Hampshire, Thayer trained in Paris and New York, becoming a successful portrait painter and leading member of the Society of American Artists. Wishing to retain his connection to the countryside, in 1888 Thayer acquired property in the quiet town of Dublin, New Hampshire, an artists' colony with views of his beloved mountain. He would settle there permanently by 1901. A generation earlier, Mount Monadnock figured prominently in the lives of the transcendentalist poets and philosophers, including Ralph Waldo Emerson and Henry David Thoreau. Both artist and naturalist, Thayer was deeply rooted in transcendental philosophies that imbued his landscapes with cultural, spiritual, and personal significance. He regarded his landscapes as a form of portraiture, true to nature. Upon learning in 1911 that a group of private developers wanted to purchase an expanse of Mount Monadnock, Thayer successfully organized the local community around its conservation. When he died, his ashes were scattered on its summit. lower right: Abbott H. Thayer; center right verso: To Franklin MacVeagh / from Abbott Thayer / In Memory of the former's great kindness / in the summer of 1911. / Dublin N.H. The artist; presented to Franklin MacVeagh, Cornish, NH; probably by descent to his son, Eams MacVeaugh, Chicago; purchased 1934 by the Corcoran Gallery of Art, Washington; acquired 2014 by the National Gallery of Art. Loan Exhibition from Corcoran Gallery of Art: Selected Group of Twenty American Painters, Mint Museum, Charlotte, 1939, unnumbered catalogue. Loan to display with permanent collection, Norfolk Museum of Arts and Sciences, 1950, no catalogue. A Century and a Half of Amerian Painting: Selections from the Corcoran Gallery of Art, Dulin Gallery of Art, Knoxville, 1963, checklist no. 20. Conservation in the Museum, Corcoran Gallery of Art, Washington, 1972, unpublished checklist. American Landscape Tradition, Corcoran Gallery of Art, Wshington, 1978, unpublished checklist. American Impressionism, Henry Gallery, University of Washington, Seattle; Frederick S. Wight Art Gallery, University of California at Los Angeles; Terra Museum of American Art, Chicago; Institute of Contemporary Art, Boston, 1980, unnumbered catalogue. Abbott Henderson Thayer, Everson Museum of Art, Syracuse; National Academy of Design, New York; Currier Gallery of Art, Manchester; Norton Gallery, West Palm Beach, 1982-1983, no. 52. A Circle of Friends: Art Colonies of Cornish and Dublin, Thorne-Sagendorpph Gallery, Keene State College, New Hampshire; Hood Museum of Art, Dartmouth; University of New Hampshire Art Galleries, Durham, 1985, unpublished checkilst. Abbott Thayer: The Nature of Art, National Museum of American Art, Wshington, 1999, unpublished checklist. Encouraging American Genius: Master Paintings from the Corcoran Gallery of Art, Corcoran Gallery of Art, Washington; Museum of Fine Arts, Houston; Parrish Art Museum, Southampton; Mint Museum of Art, Charlotte; John and Mable Ringling Museum of Art, Sarasota, 2005-2007, checklist no. 70. American Paintings from the Collection, Corcoran Gallery of Art, Washington, 6 June-18 October 2009, unpublished checklist. Glazer, Lee. 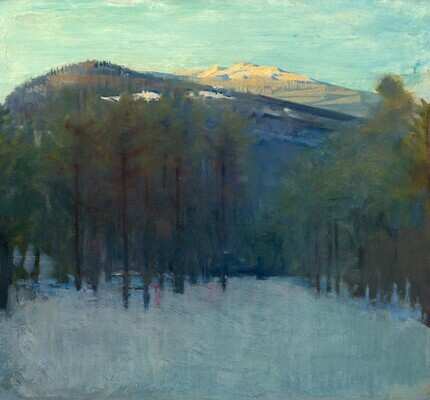 "Abbott Handerson Thayer, Mount Monadnock." In Corcoran Gallery of Art: American Paintings to 1945. Edited by Sarah Cash. Washington, 2011: 36, 206-207, 278, repro.